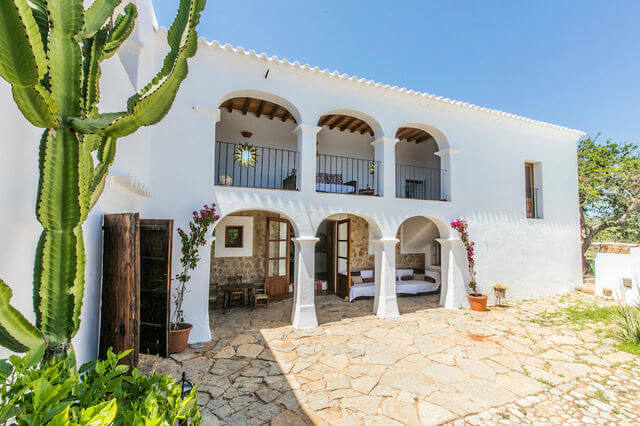 Join Scott Johnson, director of Stillpoint Yoga London and Helen McCabe, director of Yoga At The Space in Dorset, for a 7 night late summer, wonderfully intimate relaxed yoga retreat in the quiet north of Ibiza. 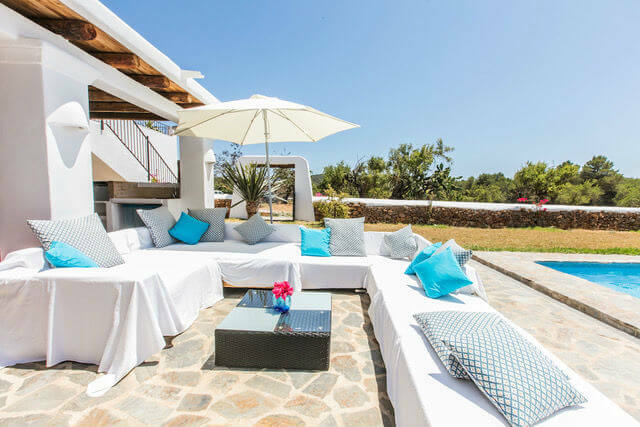 Villa Can Skye Love is a beautifully restored 300 year old country villa with secluded surroundings for total privacy. 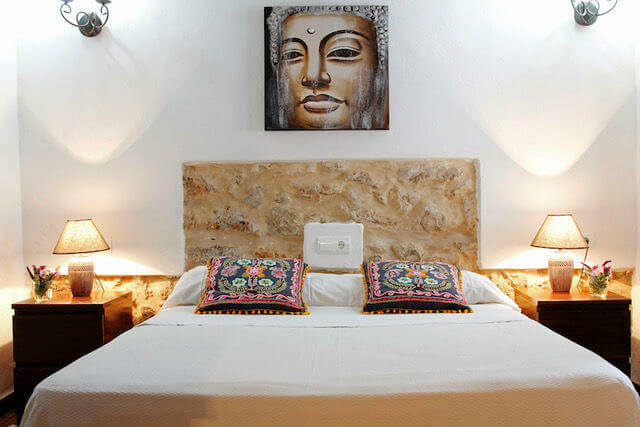 It is situated on the north part of Ibiza, close to the village of San Carlos. The villa sits amongst peaceful countryside with plenty of nature walks, fruit trees and vegetable gardens with sheep and horses as your neighbours. Here you live in harmony with nature with all the modern amenities. The many beaches on the north east are close by, a short 10 minutes’ drive. You are also close to the famous hippy market ´Las Dalias ´in San Carlos. Bedroom Orchid: 1 double/twin bedroom. Ensuite private bathroom. Second floor. Bedroom Lily 1 double/twin bedroom. Ensuite private bathroom. First floor. Bedroom Rose : 1 double/twin bedroom. Ensuite private bathroom. Second floor. Bedroom 1 Mountain View: 1 double/twin bedroom. Shared bathroom. Bedroom 2 Mountain View: 1 double/twin bedroom. Shared bathroom. Can Skye Love – The Guesthouse (the casita): A unit (80 sq) situated 5 meters from the main villa. Also has a kitchen, living room and terrace. Bedroom Romance: 1 double/twin bedroom. Ensuite private bathroom. Bedroom Peace: 1 double/twin bedroom. Ensuite private bathroom. 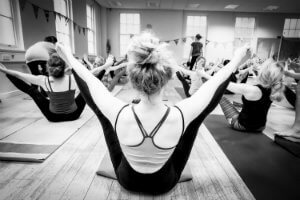 Sunday 30th September to Friday 5th October: 7am self-practice Ashtanga Yoga with Scott and Helen. The week will also include a daily morning mindfulness and pranayama practice (before self practice) and 3 afternoon workshops working on technique and the subtler aspects of yoga. 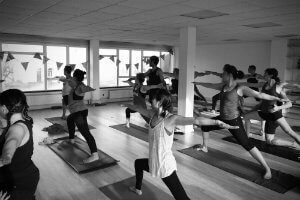 Shared Room for seven nights Daily mindfulness and pranayama sessions before the morning asana class Daily assisted self practice ashtanga yoga classes 3 afternoon classes focusing on different aspects of yoga practice. Daily post-practice brunch, dinner, fruit and an afternoon snack. Only max 14 spaces are available so don’t miss this opportunity to work with 2 highly experienced teachers in a small group, developing your practice in this beautiful location. Prices include all yoga, pranayama and daily mindfulness sessions as well as daily post-practice brunch, dinner, fruit and an afternoon snack. All food will be vegetarian made with fresh, locally sourced ingredients. Please let us know if you have any specific dietary requirements when you book. Please note that flights and transfers are not included. We can arrange all airport transfers which are paid for on arrival and try to group as many together as possible to keep this cost down for you. Also, a hire car is useful to get around but not essential.